As I’ve alluded to in my 2017 round up and my 25th Birthday posts for the first time in my life I am settled. By that, I don’t mean I’ve settled down with a house, husband and three kids (though that would’ve been lovely to have at 25). I’m settled in the sense that I’ve reasonably ok with where I am in my life right now. Whilst that’s great and I appreciate the stability there’s been a little voice in the back of my head since my 25th birthday that keeps whispering ‘What’s next?’. Cue quarter-life crisis. Fun times. To put this in context, since the age of 10 I’ve been on the path careering towards a getting a University degree and starting a career in something that makes a reasonable amount of money (oh the joys of having Asian parents!). Well, I’m here now. It’s been three years since I crossed the stage and shook Sandi Toksvig’s hand (pre-GBBO she was Vice-Chancellor at my Uni at the time, no biggie!). I’ve been absolutely blessed to have gotten a graduate job before moving swiftly into a field I’m actually interested in and to a city I adore. I realise that path is not one that many my age have achieved. I am extremely privileged in that respect. What slowly dawned on me in 2017 was that I’ve been chugging along a bit directionless for a while. That doesn’t mean I haven’t been achieving anything per say, but it’s all been a bit disjointed and I like having a plan. 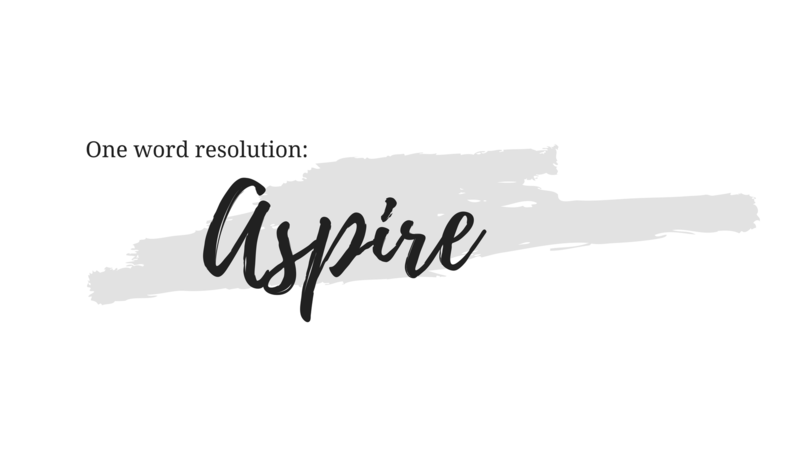 Aspire: Direct one's hopes or ambitions towards achieving something. Whilst 2017’s ‘Balance‘ allowed me to look inwards at myself and what my priorities are ‘Aspire’ now paves the way to look ahead and dream again. The future can be fickle but I’m determined to get that feeling of reaching towards something again not stagnating because it’s easier. ‘Aspire’ is a little selfish. It’s a little ‘dreamy’. It means facing that big scary ‘What’s next’ question head-on with a little more direction. It’s active, terrifying, and exciting in equal measure. Part of the resolution has involved me creating a loose 5-year plan and a 30 Before 30 List. In terms of what that means for this year, it means laying the groundwork for those plans in all aspects of my life. Thinking beyond 2018 has been daunting, but creating aspirations that reach further than a calendar year is exactly what I feel I need to do right now.